Evi Katsapi of Psychology and Human Development in UCL Institute of Education shares 9 steps to building a learning community. The BSc Psychology with Education programme launched four years ago, with 19 students and currently has 127 students. The programme director is Evi Katsapi, winner of UCL Students' Union's 2018 Student Choice Award for Active Student Partnership. "Since taking on the programme leadership in 2015, I have been working with the entire undergraduate teaching team, student academic representatives and students to create a sense of community across the programme. 93% felt that staff valued their opinions. In the New to UCL survey, 96% said they felt welcome and supported by the team at the beginning of their studies. This feeds into an 87% overall degree satisfaction (against 80% for UCL). An undergraduate student on the Psychology with Education BSc commented: "Evi has established a collaborative and warm environment within our programme in which students are encouraged to share their thoughts and are treated as partners." We deal with an issue or piece of feedback promptly (within three working days), and if we are not able to address it immediately, then we acknowledge it and outline next steps. We make information available: meeting minutes from all relevant meetings, e.g. SSCCs and Programme Committees are added to Moodle and all students are invited to give their feedback and offer their opinion. As programme director, I meet regularly with student academic representatives (student reps), student mentors and staff. I also drop into sessions and seek informal feedback from students on how their studies are going. The degree has introduced ‘Unitu,’ an online platform which students can use to raise issues, options or suggestions, which are then voted on by other students to escalate to staff. Once student reps are trained on this platform they run a training session for their peers on how to use it, so that all students have a voice. Staff then use the platform to address the feedback, thereby ‘closing the feedback loop’. In one case it became clear that first years didn’t understand what was expected of them for a report, but they weren’t comfortable telling staff. Transition Mentors were asked for their views on how new students were settling in and they passed on this feedback. The issue was then immediately acknowledged on Moodle and the first year students were invited to a face to face Q&A session focused on the report in question. In addition, the module leader created an online Q&A forum on Moodle and invited further questions on the forum. It’s important to offer plenty of face-to-face opportunities for students to speak to you and ensure that from the Induction Week onwards students are aware of who to go to for what, e.g. our programme team offers weekly drop-in sessions and make it clear that there is an ‘open door policy’. In fact the drop-in sessions are not very busy, as most feedback has already been addressed through other routes, but it helps give students a sense that you value interactions with them. We involve students in developing solutions: for example, students didn’t like a module key textbook and this was flagged at the programme meeting. Staff and students then collaborated to identify another textbook, which covered the entire curriculum needed but students found more accessible. Current students are involved beyond their immediate degree and are encouraged to be involved in taster days, open days and summer schools, taking an active role in developing or teaching the programme/event. We run a mentoring scheme where our current students act as mentors to year one students; meeting them weekly and supporting them socially and academically. We have also created volunteering teaching assistant opportunities within the degree where year 2s support year 1s and year 3s support year 2s in workshops. Last year for the first time we run an undergraduate conference where third year students presented posters of their dissertation research findings. I organised this with a team of third year students supported by ChangeMakers funding. We encouraged first and second year students to get involved so they know what to expect when it is their turn. We also involved students from other programmes who take our modules as options to build interdisciplinary and cross-departmental bridges. The creation of awards within the degree has also helped build a sense of community and pride. Students are encouraged to vote amongst themselves for who should get the award, e.g. Collegiality Award, Commitment to Studies Award, Classroom Participation Award. Fewer lectures and more in-class activities help to build rapport between both students and staff. Simple things like encouraging students to sit with people they haven’t worked with before help to develop a bond within the cohort. We give students the opportunity to share their experiences as we want them to learn from each other as well. Furthermore, we try to vary our teaching environments; e.g. 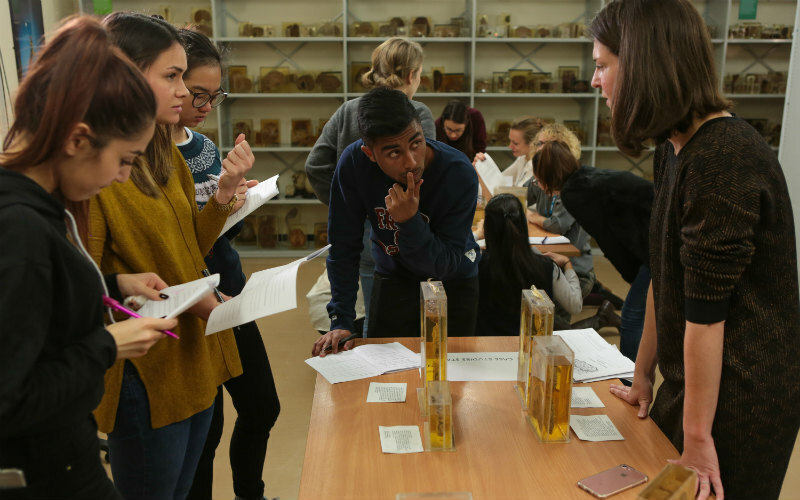 for year 2 Brain and Behaviour module we visit the Pathology Lab at Royal Free hospital where our students can examine real brain specimens. The degree has several social media accounts, including Twitter, Facebook and Instagram. These channels are used to share news and opportunities such as events or lectures or extra reading suggestions. We share social events with current students and alumni throughout the year - Christmas parties, careers events, end of year celebrations and other opportunities to network and meet colleagues and peers. One successful activity I run is the ‘transitions to next year session’ where we meet the students in Second Term to discuss the following year. This helps students to understand what is expected of them as they transition from first to second year and from second to third. Students are presented with the module options and the way they are assessed and any pre-requisites are explained. An option modules booklet with information is posted on Moodle. The students are then given a month to consider them and ask any questions. After that students understand that they are expected to make a firm commitment to their module choices and a change will only be allowed in exceptional circumstances. This way, staff can plan accordingly for the following year in terms of room bookings, staffing and timetabling. Skills and CV sessions are offered giving students the opportunity to reflect on everything they have learnt during the programme. This is useful in third year ahead of the NSS as it’s an opportunity for students to recognise the range of skills they have developed throughout their studies as well as the opportunities they’ve had to apply what they’ve learnt to different situations, and to explore concepts in depth. Our teaching team works closely with the Academic Writing Centre, UCL Careers Service and the Volunteering Services Unit to develop bespoke interventions. These can be as simple as advice on how to write a personal statement or inviting external speakers and alumni, to speak for five to ten minutes at the end of a lecture. All students are encouraged to engage into some hands on experience to enhance their CVs and through personal tutoring staff help students to seek opportunities and apply for them. Personal tutors are supporting students not only academically but emotionally too. We want to extend our ‘community’ to include Masters and Doctorate students within the department and the UCL Institute of Education Faculty. So, we plan to set up a psychology and education society involving undergraduate and postgraduate students. I would also like to get students involved in self and peer-assessment and explore new ways of assessing. Prevention is better than cure - actively seek feedback. I drop into lectures to see how it’s going and use personal tutoring sessions to ask ‘is there anything you would like to see done differently’. I also meet student reps regularly and offer ‘open door’ times. Care for your students’ well-being! Address issues quickly - even if it’s just acknowledging the issue to start with and providing a timeframe for responding. Build cohesion across year groups e.g. invite all year groups to social events, inductions, etc. Be honest with your students - show you value their opinion but be clear, they also have responsibilities and there are expectations on both sides. Successful induction is crucial - set the scene and the culture early, making sure you drop into sessions and become a familiar face.